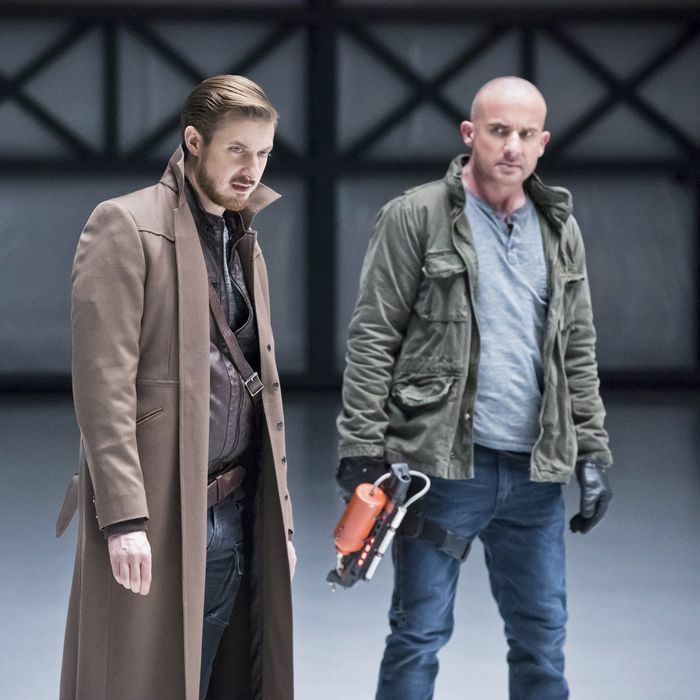 Arthur Darvill as Rip, Dominic Purcell as Mick. As the first season draws to a close, it’s tempting to suggest that Legends of Tomorrow has improved. Don’t be fooled: At best, it is uneven. At worst, it is an absolute mess. It’s hard to believe the season’s arc is coming to an end, considering how our so-called heroes have actually accelerated Vandal Savage’s plan for world control. Week after week, the show falls victim to a trio of fatal flaws: A lackluster villain, unclear developments, and a main narrative that isn’t wholly compelling. Perhaps this is why the best episodes tend to completely sideline Savage, and instead throw the team in a new time period where crazy hijinks ensue. It’s fun to imagine what Legends of Tomorrow could be if it realized its strengths. What would it be like if the show jettisoned its Big Bad in favor of contained stories, a la the Justice League cartoons? Past Sara’s voice sounds more high pitched than usual, which doesn’t seem like the best choice. At least she’s safe. But just when things seem to get too easy for everyone, Rip Hunter and the usually trusty Gideon are unable to track the Pilgrim in the timeline. I’ll say this about the Pilgrim: She’s earned my gratitude for interrupting yet another romantic conversation between Kendra and Ray. While they cover the same ground they’ve covered in previous episodes, Ray suddenly doubles over in pain — it seems the Pilgrim attacked his past self, circa 2014. The team is able to save Past Ray, and then Hunter comes with a new plan. As you’d expect, it’s another stupid idea: Grab the team as newborn babies … which will somehow prevent the Pilgrim from grabbing them at any other point in time … because it removes them from the timeline? If they’re gone for too long, though, the timeline will set as if they never existed, essentially wiping the minds of anyone who knew them. If you think about this for even a few seconds, it doesn’t make any sense. Legends of Tomorrow plays fast and loose with time travel, but this is especially egregious. Hunter decides to drop off the newborns at a special home run by his adoptive mother, who raises young, orphaned, would-be time travelers after they’re plucked from various points in time. She may work for the Time Masters, but she’s loyal to her children. Speaking of the Time Masters, how do we still not know how they work? It’d be nice to get some more detial about them, since they’ve been positioned as such significant villains. The Pilgrim fares better than the other assassins sent to kill the team. She perhaps plays things a bit too straight, coming across less as a human being and more like a Terminator whose only focus is her mission. But her menace, effectiveness, and ability to slow down time at least give the episode a sense of urgency. Here’s what makes no sense about this episode: If the Time Masters are all about protecting the timeline, wouldn’t they be opposed to killing off the team when they were so young? Isn’t it possible that their deaths would bring disastrous consequences? Kendra doesn’t seem to be targeted since she can reincarnate; neither is Hunter since his role is too important. As the Pilgrim targets their loved ones — including Jackson’s father, James (Eli Goree) and Ray’s soon-to-be dead fiancé, Anna (Barbara Kottmeier) — these plot inconsistencies mounted even further. Killing the team and their family members would simply have to affect the timeline, if only in some small way. Shouldn’t the Pilgrim have been fired at this point? It gets worse, too. When Hunter offers up his own life — not his present-day life, but a much younger version of himself, before he joined the Time Masters — that would irrevocably change the future, since he’s had so many missions to protect the timeline. They meet at an abandoned Time Masters outpost to trade the very, very young Hunter with Jackson’s father (and presumably, the other family members). Of course, they’re not going to let the Pilgrim kill a child, which she evidently has no qualms doing. The final battle is pretty cool, as the Pilgrim uses her aforementioned powers to slow down everyone. With the Pilgrim’s victory nearly at hand, the team is saved by the one person she isn’t looking at — the young Rip Hunter, who stabs her, giving the team a chance to finish the job. That kid must have had a tough life. “Last Refuge” is a mess, but it does have some good moments. It’s nice to see Jax get some much-needed development in a storyline with his father — and Jax warns him of his impending death at the end of the episode, so that may change the timeline. For a show that makes time seem precious, it’s astounding that there aren’t any firm consequences to what happens in this episode. It also ends on a muddled note, as Hunter says they can’t return their baby selves to their proper points in time. Why? I really don’t know. “Last Refuge” is also weighed down by the Ray and Kendra relationship. If you thought Kendra’s decision to make her own destiny meant we wouldn’t have to deal with Carter and all that tired “soulmate” talk, well … think again! I swear, these two have the same damn conversation every episode. It’s so back and forth. Can she make up her mind already? So, Ray proposes to Kendra. She accepts because she’s afraid he’ll be killed by the Pilgrim, but after he survives, she gets cold feet. He overhears her conversation with Sara and later confronts her about this. This idea of soulmates and destiny is so contradictory. Of course, Ray and Kendra patch things up and she decides that, yes, she will marry him. But who cares? As long as Kendra is defined by the guy she’s with, she will never be a compelling character. Right now, she has no interior life. And that’s why Legends of Tomorrow is such a frustrating show. Even when it’s enjoyable, even if only for fleeting moments, its flaws are overwhelming. There are some great characters lurking in here, like Leonard, who doesn’t get much time in this episode. But without a dynamic villain and a convincing main storyline, the show can only do so much. Is it too late to change course before the season ends? As much as I enjoy the chemistry between some of the cast members, the legacy of this show has already begun to take shape: Barring major changes, it has utterly wasted its potential.